I gave my old course materials to a friend. Can I get in trouble? The quick answer - Yes. Depending on what your friend does with your work, you could face a number of honor code violations in school. Cheating - If you friend uses your old tests, lab reports, or other information to gain an academic advantage, it can be considered cheating. Plagiarism - This can happen if your friend takes some of your old work, like papers, and uses all or portions of it as their own. Intellectual Property violation - If your friend uploads your old materials to websites, it can be considered selling intellectual property. The professors materials are protected by the university, and distributing or selling them is a violation of the code of conduct. I didn't think sharing my old work would be a problem. My friend just wanted to look at it to get an idea of how to complete an assignment. While this may be true, the university will most likely take the position that since it is in your student handbook, you should have known. How do I defend an accusation of cheating or plagiarism if I get in trouble for giving a friend my old classwork? The defense depends on what happened when your friend used your materials. Being honest is a good start, but you may still land in front of an academic integrity panel for a disciplinary hearing. Can you help me build my university code of conduct defense? Yes. I help students all over the country defend accusations of cheating, plagiarism, and more. Using my nearly 20 years of legal experience combined with a specialized knowledge of the student disciplinary process, I prepare students to gain winning outcomes. 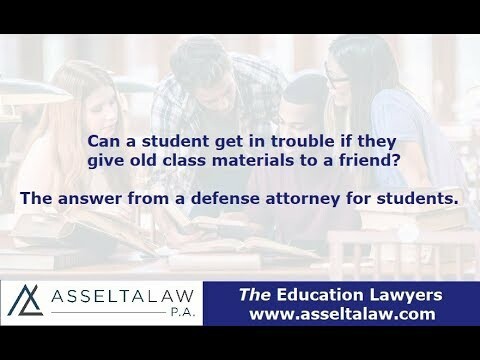 Richard Asselta is a student disciplinary defense attorney who represents students in all education settings. Click here to read client reviews on Avvo, an attorney review website.